All photos courtesy of Nordiska Museet. 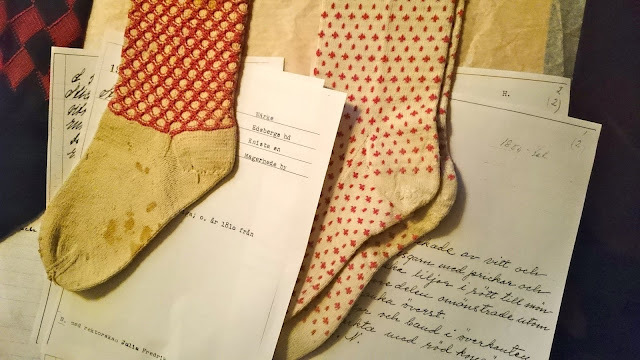 Once a month, during the Spring and Autumn, the Nordiska Museet hosts a Stickcafé (knitting café) in the museum restaurant. 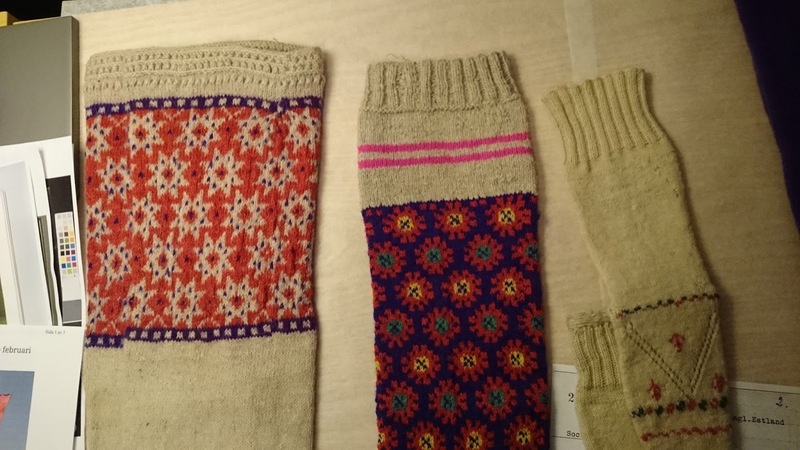 This free event is open to anyone who wishes to come for fika and knitting, and includes a lecture on an aspect of Swedish knitting from the museum collection. 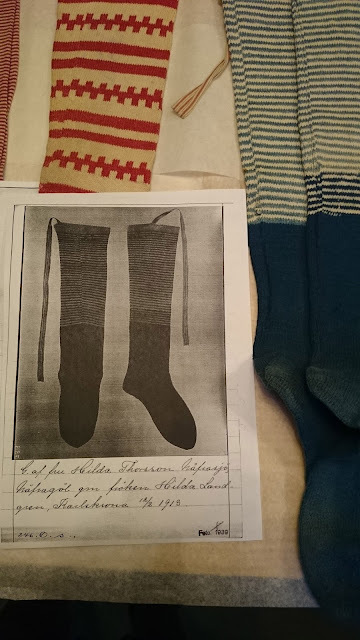 The talks are usually in Swedish, but luckily for me, the second Stickcafé that I went to featured an archive show-and-tell of historical socks. The curator was on hand to answer questions, and wearing white cotton gloves, we were free to handle and examine the socks at close hand. What an amazing opportunity! The socks on display ranged from silk stockings made in Paris from the Regency era, folk patterned traditional Swedish socks, everyday socks for men and women, and even a few much-mended, rough and utilitarian house slippers. 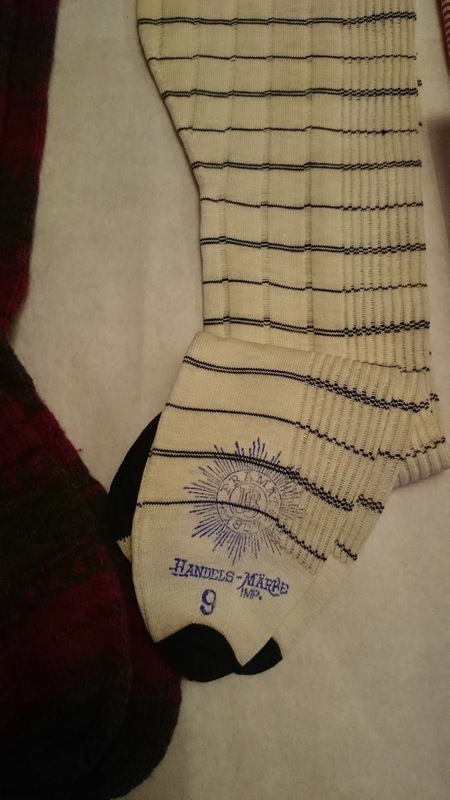 It was truly a broad selection, including socks from peasants as well as princesses. Unfortunately the lighting was very dim, but I was able to take photographs of some of my favourite pieces to share with you. My favourite socks featured striking details on the cuffs, particularly in colourwork. It doesn't have to be complicated to be eye-catching though, and I also love the simple addition of two bright pink bands, and the garter stitch lace cuffs of the second photo. A beautiful stocking detail that's simply lost today. 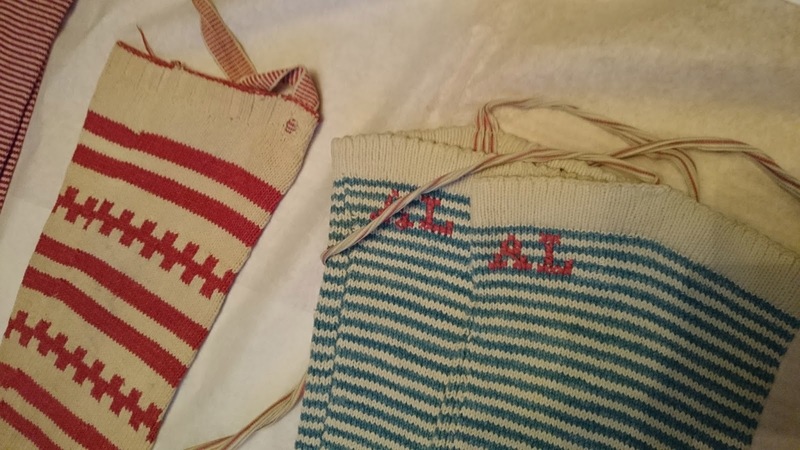 In the top photo, the white socks are hand-embroidered, folk art style; the others are much finer stockings with elaborate clocks. 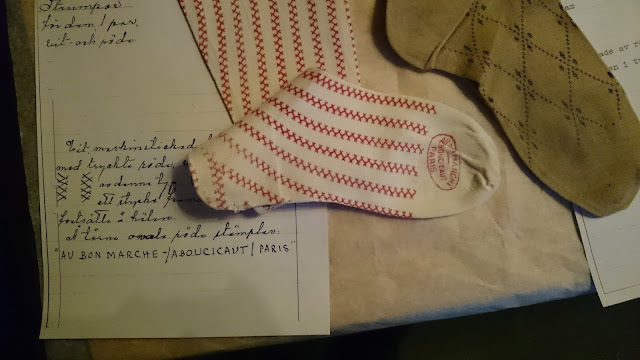 The printed labels help the archivist to date the stockings precisely. 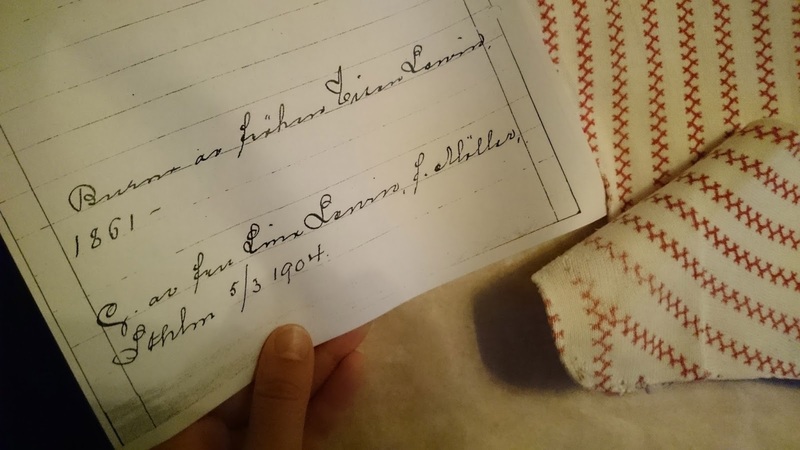 In the second photo, the pattern on the Parisian red and white stockings is printed, not knitted in. And I just adore the cross-stitch monogram below the white picot hem of the blue striped sock. As amazing as elaborate, multi-coloured stranded folk knitting is, I'll always be drawn to clever uses of just two colours. Red and white is always a classic, and I love the colour blocking on the blue striped stockings, where the stripes would protrude over a boot. 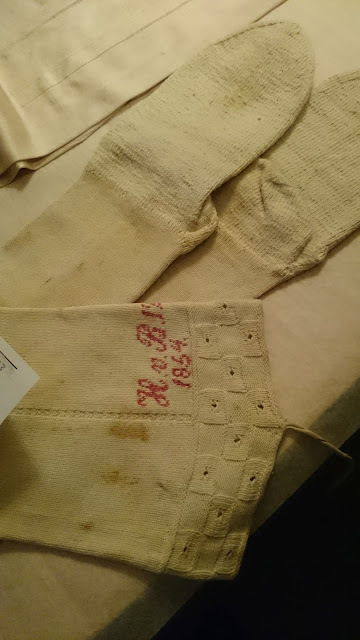 There were many examples of very fine stockings for the upper classes, such as this stunning white cotton lace pair that was machine-knitted; and of course the lovely folk art stockings. But the museum also include examples of rough, everyday knitting. 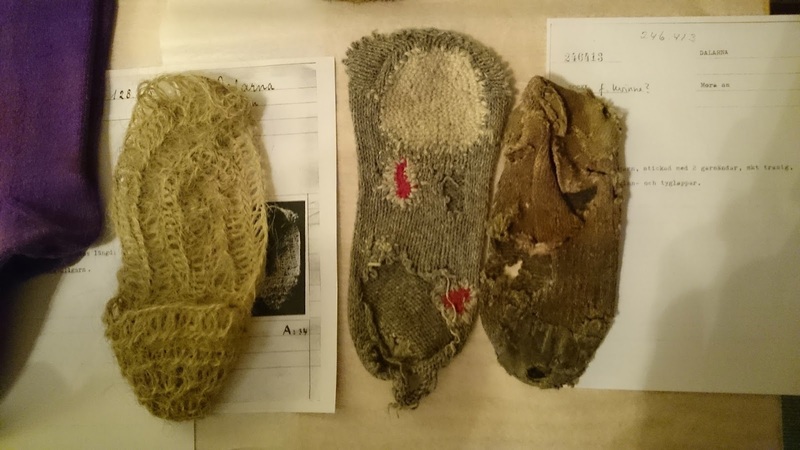 Although by comparison the slippers in the bottom photo are horrible and rather dirty, there's something very appealing about seeing examples of clothing that has really taken heavy wear. Not kept in a box, but battered by the feet, and darned again and again. You can really see the different lives that people have led through their footwear. I regret not taking more careful notes about the dates of all of the socks...in my defence, it was a small and crowded room! 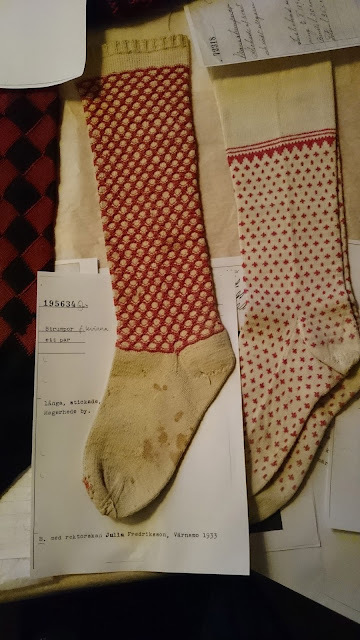 Seeing the socks in the archive really showed me how little I know about knitting history, and how limited my knowledge of hosiery history is. or instance, did you know that the first knitting machines were developed as far back as the 16th Century? I didn't! This event was such a great way to discover more, and I'm very grateful to have stumbled upon it! Many thanks to Nordiska Museet for allowing me to take and share these photos.